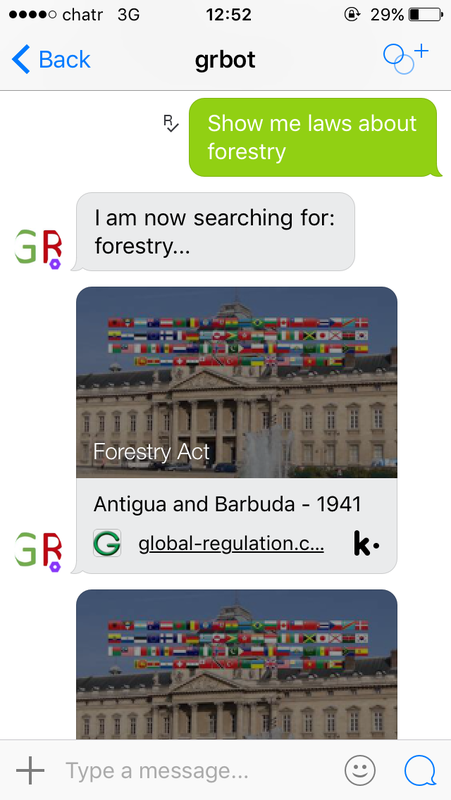 We are very excited to announce the launch of the first ever legislation chatbot: GRBOT, using the Kik mobile platform. The GRBOT enables the users to type a request: e.g., “search for United States drone laws” or “Show me EU laws about organic farming”, and the GRBOT will send the most relevant laws to the users’ mobile device, with a link to see more. You can see the bot in the Kik Bot Shop here: https://bots.kik.com/#/grbot. The only thing needed to connect to the GRBOT is to download the Kik app from the app store and friend the GRBOT account. When you first start chatting a message is displayed that shows a few examples of how to interact with the bot. We think we’re the first ever legislation chatbot but there have been other legal bots created, both on chat platforms and accessible through other services.